Certified organic farming is a systems approach to production and handling. Certified organic farmers face the same challenges that conventional farmers face, they just use different--and most would say--more sustainable methods to address them. For example, we use beneficial bugs (praying mantises, lady bugs, etc) to kill the bugs that are harmful to the trees, therefore providing a healthy alternative to pesticides. In addition, we use organically-produced compost to transform the soil into a fertile zone. We disk, mow, or use animals (such as sheep) to graze instead of herbicides. To keep us up-to-date and on the ball, organic farming requires certification, which involves checking detailed farming records and on- site inspection and testing. Who are we certified by? The US Department of Agriculture manages the National Organic Program (NOP) and empowers certification upon a number of certification organizations. There are many companies that offer certification for a fee. They all perform the same function. 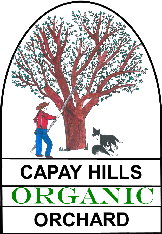 We are certified organic by Yolo Certified Organic Agriculture (YCOA). YCOA was created and inspired by the community it serves: local growers and consumers. The certification standards used by YCOA are the USDA's National Organic Program. YCOA is a USDA accredited certification agency. Terms like “beyond organic,” “no spray,” “pesticide free,”, and “grown organically” do not denote the same meaning as certified organic. Only certified organic products are annually verified as being produced to NOP standards. Bottom line: Farming organic requires much more time and effort and is financially intensive, but like most things in life that require more effort ... in the end they are worth it.